The Bohemian composer Jan Dismas Zelenka was a double bass player and church music composer at the Saxon court of the Elector August the Strong and his son Friedrich August II. In the years after 1721 he composed an extensive repertoire of Catholic church music together with the Kapellmeister Johann David Heinichen. These works, together with the Dresden operas composed by Johann Adolf Hasse in quick succession from 1731 onwards, established the reputation of the Saxon court as one of the most important musical centers of the late Baroque period. 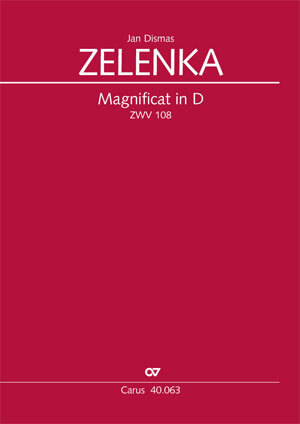 The two Magnificat settings (C major, ZWV 107; D major, ZWV 108) are amongst well over 30 psalm and Magnificat settings by Zelenka for Vespers services in Dresden. In contrast to the work in C major, where a soprano solo dominates over long passages, the choir has a more prominent part in this Magnificat in D major. Zelenka also heightened the festive character of the work by later adding parts for 2 trumpets and timpani. Authentic performances of the work are therefore possible with and without trumpets. As with other editions by Carus, it is possible to purchase just the choral score in a less expensive version than this full score. The orchestra includes 2 oboes with optional timpani and 2 trumpets in addition to the string and organ. Their music is very active throughout with a mixture of voice doubling and separate contrapuntal lines to enhance the texture. Only a Latin text is given for this 11-minute setting. Within the three movements there are numerous short internal sections with tempi changes. Zelenka was a Prague musician whose music is less common to most directors in America, but he was well respected in Czechoslovakia during his lifetime. […] Good music that is not difficult.